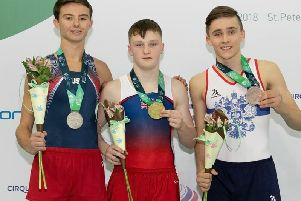 The team only sent four gymnasts to the competition - Milly Cold and Rebecca Dormer, Libby-Leigh Corby and Niamh Cole, but all of them came away with medals around their necks. In the synchronised 16 year-old girls pairs, Milly and Rebecca hit the heights with good form and jumped like a mirror to take the gold. In the 10-year-old girls event, Libby-Leigh performed a fine routine to take another gold. In the under 10s, Niamh fought a close battle with her rival but took a worthy silver.